Hold on to your hat. This is Donelian's 9th set for Sunnyside, and even after a four decade career where he played with all the jazzbos that matter, he still might be the heaviest cat you never heard of. A New Yorker that likes to explore his Armenian roots, he is a piano improv player of the first order. This is an angular set of sitting down jazz that certainly doesn't take things lightly. Certainly the kind of cat that knows how to keep a foot in each of the past and the future, he's captured that vortex where moldy figs and progressives can meet and each be right about what they hear, even if they can't convince the other. Donelian and his crew know how to work up a sweat. While cohesion and individuality, by their very definitions, may seem to be at odds with one another, the music on Leapfrog reconciles these two opposing ideals without a problem. For his ninth date on the Sunnyside label, pianist Armen Donelian has together a program of strikingly modern originals that showcase the cutting edge talent and simpatico sensibilities of his band. The personnel in Donelian's quintet might, at the surface, seem like an intergenerational mishmash, but that couldn't be further from the truth. Donelian and veteran bassist Dean Johnson began making music together in the early '80s, and the pianist's work as a jazz educator at institutions like The New School and William Paterson University brought him into contact, at various times, with tenor saxophonist Marc Mommaas, guitarist Mike Moreno, and rising-star drummer Tyshawn Sorey. As individuals, each player puts his own imprint on the material at hand. With an ability to inhabit a groove, while simultaneously disassembling its parts, Sorey slams with cymbal-centric fury (”Rage”) and swings with a combination of taste and unrestrained abandon (”Smoke”), but he also knows how to play the minimalistic straight-man when the music calls for it (”Mexico”). Johnson proves to be the ultimate musical marksmen, nailing every musical hit and turn with a sniper's precision, but his skills don't end there. His big ears help him in helping others as he builds a comfortable, aural safety net around his band mates, and proves a strong soloist when stepping into the spotlight. Mommaas mines the mood of each piece to the fullest possible extent while Moreno, in similar fashion, manages to shift his sound from searing (”Rage”) to soothing (”Mexico”), suiting the nature of each number. While Donelian plays several different parts here, his most important role is that of a bonding agent. The quintet unites under the banner of his piano work, and he leads by example, as all good teachers should. Leapfrog proves to be light years beyond many other albums that wear the modern jazz label, because the individual contributions and the confluence of the group are of equal value, and Donelian deserves plaudits for balancing that equation and producing such a work. The game of leapfrog is an anomaly. It’s not an exhibition of brawn, and it requires no premeditated strategy. It isn’t a team sport per se, nor is it characterized by star athletes or bouts of glorified showboating. It’s the essence of simple pleasure, a diversion free of competition, catalyzed by the vigor of its young players. Pianist Armen Donelian couldn’t have picked a more appropriate title for his ninth Sunnyside album. Leapfrog is a panorama of spacious arrangements, instrumental turn-taking and bounding euphony put forth by a team of voracious up-and-comers—guitarist Mike Moreno, tenorist Marc Mommaas and drummer Tyshawn Sorey. Donelian recruits veteran bassist Dean Johnson to anchor curiously modern compositions while diligently mentoring his contemporaries. Leapfrog is a vast lyrical playground in which Moreno, Mommaas and Sorey are free to roam, and it illustrates their heightened individual abilities and ranges. In the style of the game, Johnson and Donelian lay the foundation for their collaborators to saunter joyously between the former’s carouseling bass lines and the latter’s swirling piano calliope. On “Behind the Veil,” Moreno floats between shimmering chorus, subtle, ’60s-style tremolo, and warm solos, driving his point home with theatrical hammer-ons and sweeps. A master of restraint, Sorey refines his sound with a buttery-smooth brush technique but also knows how to swing, interchanging freewheeling, cymbal-fueled bop on “Rage” with tribal rhythm and ambient drop-outs on “Mexico.” Mommaas intelligently weaves in and out of the mix, navigating the spectrum of styles with eloquent interjections and circular breathing on “Bygone.” Donelian steps in when needed on “Smoke,” applying steadfast yet understated interludes. Leapfrog is a free-spirited road trip, not a think piece. It’s a landscape of hills and valleys traversed by a vehicle of both cohesion and personality. Plus, it’s fun—just like the childhood game. The tour itinerary on the Donelian’s website lists CD release shows at Firehouse 12 in New Haven, Conn. (Sept. 23), and at The Cornelia Street Cafe in New York (Sept. 24). One of the true veterans dotting the NYC landscape, Armenian-American pianist Donelian plays mainstream jazz with a verve and expertise typical of the upper echelon of performers. With nine recordings for the Sunnyside label since the 80's, Donelian has cemented his estimable reputation worldwide as a pro's pro. And he's a well-regarded teacher on the New School's faculty. A Fulbright Senior Scholar in 2002, he's also authored widely used instructional texts. This performance will be a CD release party, celebrating his latest recording Leapfrog (Sunnyside). Joining him will be Dutch tenor saxophonist Marc Mommaas, guitarist Mike Moreno, bassist Dean Johnson and drummer Tyshawn Sorey. A prolific creator of music, pianist Armen Donelian’s latest recording Leapfrog is a continued foray into the interplay of musicians. Donelian has a terrific touch at the keys and notes, writing all but one of the tunes on a project that speaks in more contemporary musical vernacular. His compositions have a very fusionesque quality that serves as a solid platform for the musicians on the recording to display their individual virtuosity. Joining Donelian on this project is a very skilled quintet of guitarist Mike Moreno, bassist Dean Johnson, drummer Tyshawn Johnson and saxophonist Marc Mommaas. A very worthy artistic and contemplative effort. Some jazz improvisers express themselves through original compositions, while others express themselves through standards. Of course, one doesn't automatically rule out the other; being standards-friendly doesn't mean that an improviser cannot be creatively successful as a composer. Different artists have different standards/original material ratios, depending on what they feel works best for them. On his Sunnyside recordings of the '90s and 21st century, Armen Donelian hasn't been terribly standards-obsessed; he might include one or two of them on an album, but his own compositions have often dominated his releases. And the acoustic post-bop pianist doesn't include any standards at all on Leapfrog, a self-produced 2010 date that employs Marc Mommaas on tenor sax, Mike Moreno on electric guitar, Dean Johnson on bass, and Tyshawn Sorey on drums. The only thing on Leapfrog that Donelian didn't compose is Mommaas' wistful "Bygone"; everything else on this 60-minute CD is a Donelian original, and that includes the edgy "Rage," the moody "Winter," and the angular, Thelonious Monk-ish "Smoke," as well as the reflective "The Poet" and the mysterious "Behind the Veil." Meanwhile, "Mexico" (which Donelian previously recorded in the early ‘90s) is an airy piece that, according to Donelian, is meant to aurally depict the wide-open spaces that one finds in the desert of northern Mexico, south of Arizona. Donelian the composer and Donelian the acoustic pianist are equally important on Leapfrog; both of them are crucial to the album's creative success. And while Leapfrog isn't quite as essential as some of the albums Donelian has recorded in the past, this is nonetheless a solid and absorbing effort from the veteran pianist/composer. On his recent Mystic Heights, he applies that same balance [as on Wave] between tension and release to a program of sensitive originals. Wave is Volume 1 of a series by Donelian entitled Grand Ideas. The mood here is deliberate and thoughtful, evocative and heartfelt. A good case in point is "All of Me," transformed from a medium-tempo swing tune into a slow ballad masterpiece, full of surprising twists and turns, nooks and crannies. It is not just reharmonized but re-conceptualized and made new again. For a true jazz artist, the goal of playing standards is to make them sound fresh once more, to recreate the music. Re-creation is ever-present here in ways which are subtle and delightful. "Solitude" becomes a meditation on Ellington, with Donelian's singing melodies stretching into the outer spheres of tonality. "I've Grown Accustomed To Her Face" becomes a contemplation on timeless beauty. Throughout the entire recording, Donelian's sense of touch and control is astonishing. His melodies emerge from the keyboard as if magically summoned, and his harmonies and multiple reharmonizations are full of profound depth and insight. Wave is not about the velocity of swing, but about the gift of masterful musical insights and transformations. It is a mature and gracious musical blessing. Every lover of standards and every jazz musician seeking to breathe new life into them would do well to listen and study here. Wave is a gem. On the pianist's recent album, Wave (Sunnyside), Armen Donelian has pared down his considerable technique in favor of a dramatic lyricism that, in pieces as old-hat as "All of Me" and as unlikely as "Our Day Will Come" and a couple of Beatles ballads, he sustains with controlled and expressive poetry. 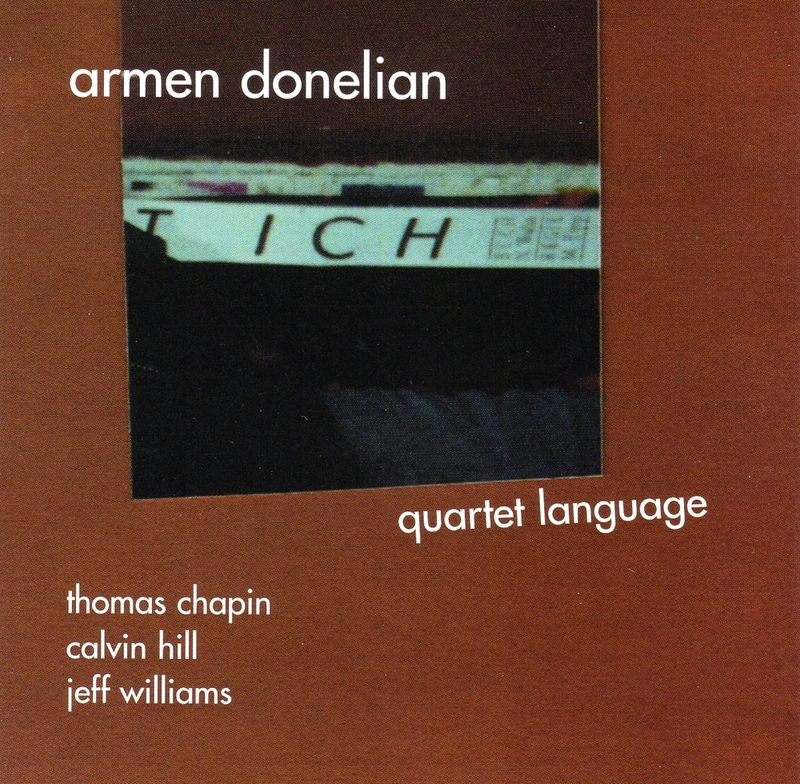 Three records of solo piano music from Armenian-American pianist/composer Armen Donelian present three different pictures in this most vulnerable of settings. Wave offers a look at Donelian the stylist doing covers; Mystic Heights is a run through an all-Donelian program; while Full Moon Music is all spontaneous composition. These three volumes constitute his Grand Ideas solo keyboard cycle. Wave shows something few artists have been able to do: play the standards across generations as if they were all part of one era. The two Beatles selections, “I Will” and “Here, There And Everywhere,” for example, come off sounding like material any jazz musician would cover, exposed without singing, guitar and drums. Either they are good songs or they aren’t. Donelian has patience with the material, playing most of free of tempo, resisting a walking left-hand, musing with blue notes, tossing off casual asides that fit. “The Song Is You” is about melody as much as it is about the line itself. Donelian’s open style is warm and adventurous in subtle ways as he rearranges the song’s structure. Mystic Heights moves in other circles, namely the world of Donelian’s pen. Like Wave, there are eight tunes, but this time he is further afield from a jazz impulse. A folk sensibility comes through, with an almost recital-like quality pervading songs like “Ode” and “Exiled Dreams,” the composer leaning on his song structure like an old friend. There is a simplicity to his style that threatens to undermine any distinctive qualities: Technique-laden frills, spills and chills are nowhere to be heard. Instead, we’re treated to measured, deeply felt playing, with a generally gentle yet fluid touch. Some tunes, like the florid “Devotion,” have a lullaby quality despite the flurries. Full Moon Music is a meshing of influences and moods, more like animated suspension. Given the totally improvised nature of the music, that’s not surprising. The open-ended, unresolved nature of most of the music means more minor chords, split-ends, so to speak. The darker qualities don’t translate into atonality, but the title alone should suggest Donelian has moved away from the tuneful muses of the first two volumes. This most recent one, more classical in nature, is more interesting if less satisfying.